Two weeks ago was our scheduled one week break from school. We had completed 5 weeks of focused learning, and were looking forward to a week off. It was a good time for all. Then last week it was supposed to be back to lessons…and sickness hit both kiddos. It wasn’t awful, but just enough to take away momentum and focus. Sinus yuck just makes it that much harder to concentrate or want to do much in general. So, last week was a miss on getting anything done. Of course we still learned, read a few books together on the couch. All-in-all though, not much forward movement. I know this is truly not a big deal, and one of the perks of being at home to learn. However, I feel like we are again trying to get back to it all. Builder and Princess got used to laying around on the couch, and having maybe too much watching time. And being so young, they just generally got out of the “habit” of school with two weeks off. We did have a good day today though, so my hopes are high! Your Turn ~ How do you come back from a bout of sickness in your homeschool? As I spend time pondering each “next step” of my children’s learning, their next activity or concept, I many times find myself out on the web looking for that just right activity. I find myself searching for an activity I already have a vision for in my mind. If I find what I’m looking for relatively quickly, great. If not, I’ll create it. However, there have been some times in which I know what I want to cover and not had any idea of how to approach it. This is where I am finding it incredibly useful to have my list of websites offering educational resources that I enjoy and are a good fit for our family. Sometimes, it is nice to have three or four websites to check rather than the entire web! Whether a child attends public schools, charter or magnet schools, private schools, or home school, it is wonderful to have a “go-to” list of resources to fill in gaps, maintain, or advance your child’s learning. That is why I want to share with you an up-and-coming website that is sure to be filled with valuable resources that will be on my “go-to” list of curriculum needs. 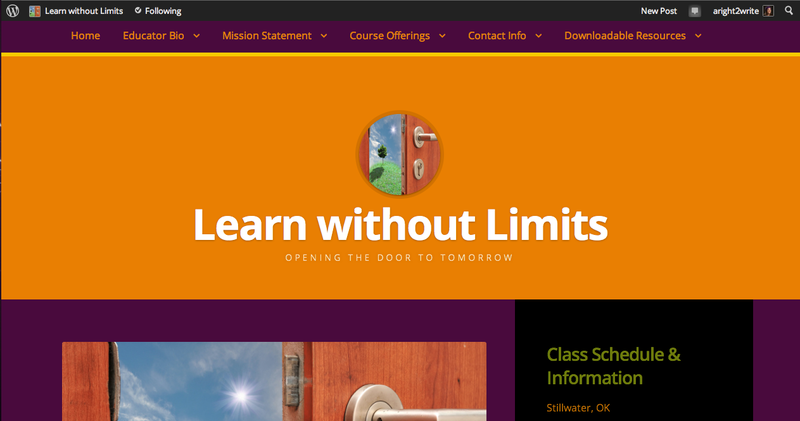 The website is Learn Without Limits. The vision of this website is to provide students and parents with access to a variety of independent professional educators, classes, and resources to help students gain skills needed to advance into their future. Currently Spanish and music/sound resources are available, with a broader spectrum of subject areas and resources to come. It is the mission of “Learn without Limits” to provide students with learning opportunities outside of the traditional classroom and to provide parents with access to professional education for their children outside of the public school classroom in order to meet requirements for higher education. This is definitely a website to add to your bookmarks and to check back periodically to peruse the resources that will be available. We all desire for our children to succeed and advance into new realms of understanding as well as walking alongside them to help usher them into the unique individual they were designed to be. This is a website that offers connections with those whose heart is to not simply offer education, but to take the limits off learning. We played Addition Bingo. This is the game described in the post Just Do It. The Bingo cards have the BINGO columns containing the sums of the BINGO question cards (B 1+3). Each time we play, I am still amazed at how many addition problems are completed. This time Mason did 15 problems without realizing it was a lesson. Love it! 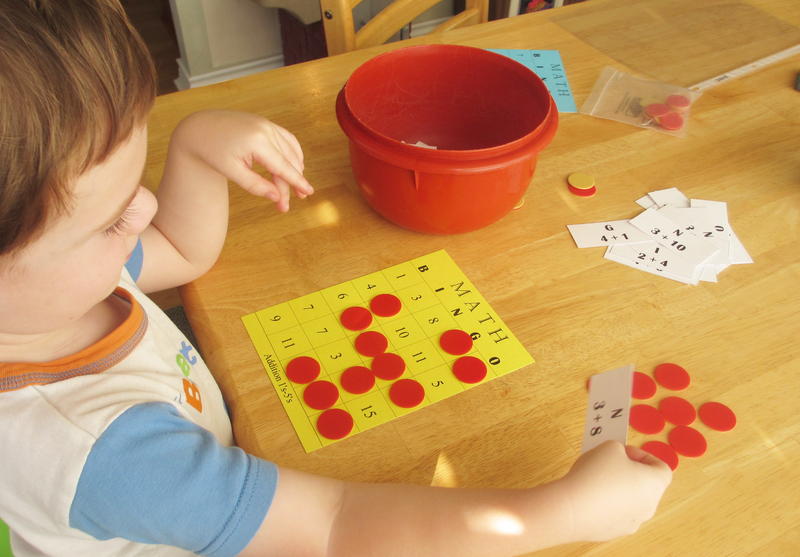 Mason has mastered counting to one hundred and has been naturally going beyond. I have also noticed as we are playing games and simply in every day life that he is noticing 3 digit numbers and working to say them. To practice the correct way of saying 3 digit numbers, I drew three lines on a sheet of paper, slipped it into a page protector and used a dry erase marker to fill in the blanks with random numbers. Once he was doing well at the 3-digit numbers, we moved onto a few 4-digit to stretch him to the next level. I found some clean, simple flashcards showing and naming 3-dimensional objects. I printed them onto cardstock and went through them with Mason. We then layed them out on the floor and Mason went around the house in search of objects that he could bring to the appropriate card. This actually turned into a fun challenge for the whole family. Mason has found a new favorite this Fall season – candy corn! 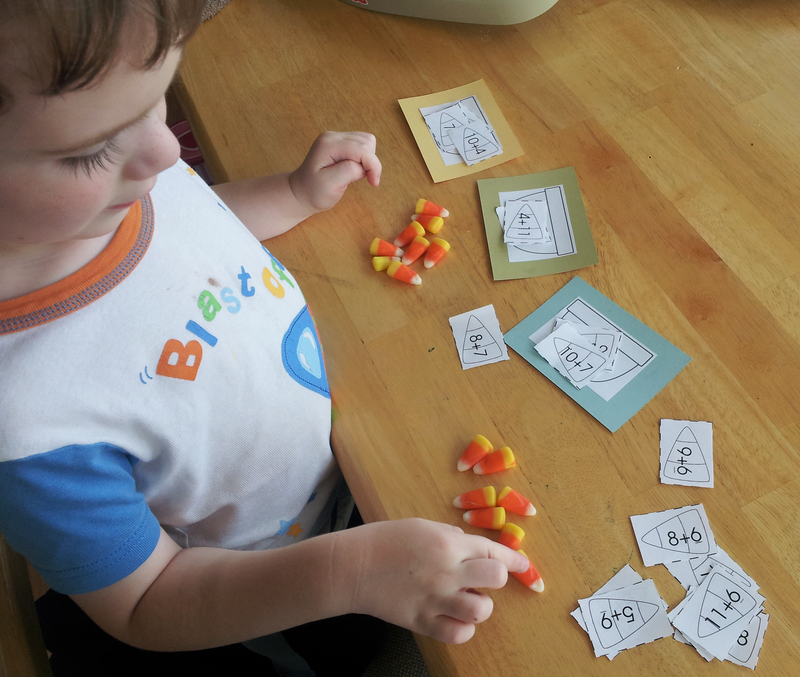 With that in mind, I could not pass on this incredibly cute Candy Corn Math Pack from RoyalBaloo. There are several pages available in the pack. We started this week with an activity that has three bowls with a sum (14, 15, and 17). There are candy corn shapes with an addition problem on each that must be placed in the correct bowl. 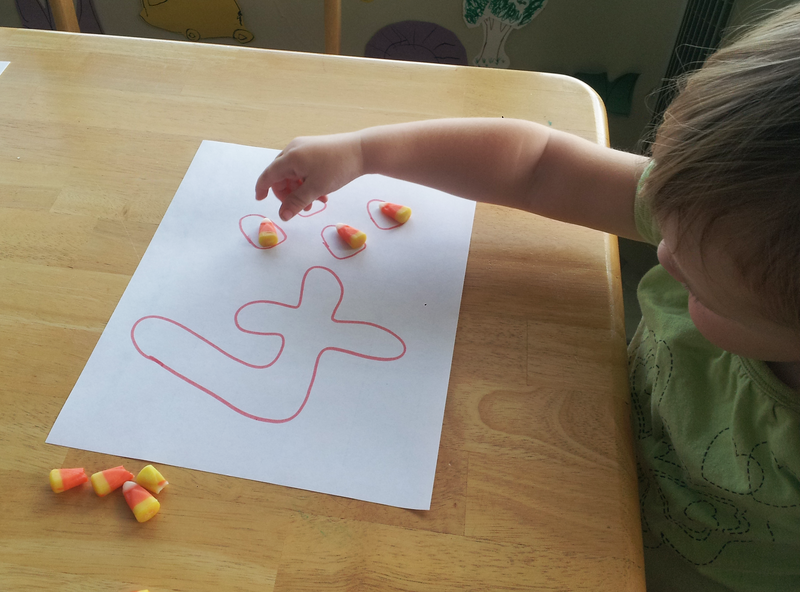 Mason was really into this activity once we started using real candy corn as our manipulatives. He was really into it when he realized he could eat the manipulatives when we were done! When the candy corn was brought out, Madison also wanted to be involved. We have been working on number quantity, so using the numbers 1-5, I drew a number on each piece of paper and then spaces to place the appropriate amount of candy corn. Taking a piece of 12″ x 12″ cardstock, I drew lines and made a “parking lot”. 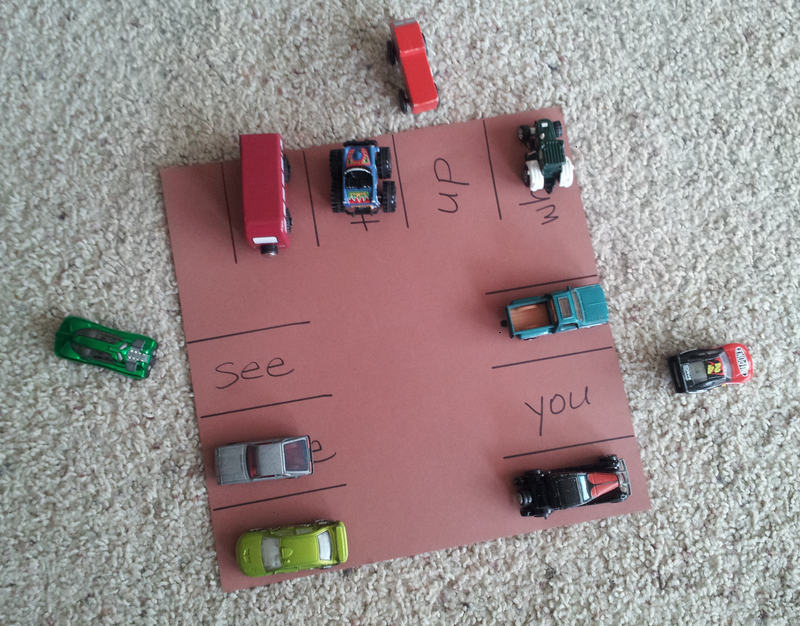 I wrote one of our sight words in each parking place. Then using the lists of sight words we have been working on, I called out a word and he was to drive a car into the correct spot. I started saying a sentence for each word. Mason caught onto this and started saying sentences himself.